By Freeola Support on 17th April, 2019 | 13 Comment(s) | 11 out of 21 people found this article useful. Welcome to the Freeola Internet customer support pages. This guide is designed to help with setting up a Freeola email address﻿ on an IPad or IPhone. For more internet help topics please visit our main Support Page. Please be aware that different software versions may have slight differences in wording and layout however you should be able to work out what goes where. To configure Freeola e-mail addresses on the device you need to go to Settings, then Passwords & Accounts, then Add Account. From the options listed, select Other, then Add Mail Account. Enter your Name, Email, Password and Description in the relevant fields. Now tap Next, your device should quickly check the information you entered is valid. This process is likely to fail, at which point you will be prompted to enter the server details manually. 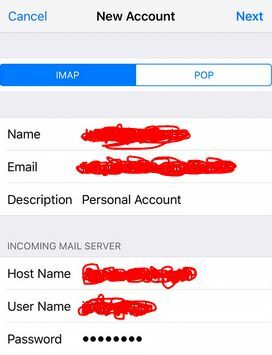 Select POP3 or IMAP depending on the type of account you have. The Name, Email and Description fields should have carried over from the previous screen. Host Name should be in the format ofyourdomainname.freeolamail.net where 'yourdomainname' is your domain name with any dots ( . ) replaced with hyphens ( - )﻿.﻿﻿ For example, if your domain name was freeola.co.uk, the incoming mail server would be freeola-co-uk.freeolamail.net. User Name is the full e-mail address you are adding. Password is the password connected to this e-mail address. Host Name should be set to smtp.freeolamail.net. YOUR APPLE DEVICE WILL LIST THE ABOVE SETTINGS AS OPTIONAL. THIS IS INCORRECT. Once this information has been entered, tap Save. 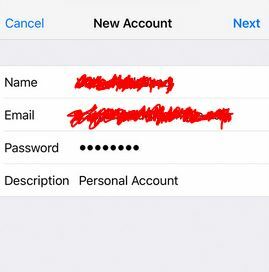 Your iPhone or iPad will now attempt to verify this information and return you to the Settings page once it has done so. By default, your Apple device should have enabled SSL protection during the setup process described above. However, if it hasn't, we would strongly recommend enabling this additional layer of encryption for your messages. To enable this, go to Settings, Passwords & Accounts, then select your newly added address. Scroll down to Advanced and select this option. From the following page slide the Use SSL option to ON. Server Port will be 995 for POP or 993 for IMAP.﻿ Tap Save. This doesnt work and should be updated. All of our guides are checked for accuracy when new versions of software (or in the case of an iPhone/iPad, operating system) are released. I have taken the liberty of double-checking the above guide this morning and can confirm that is an accurate representation of the steps needed to be followed in order to set up an account of this type. If you are having issues setting up your Freeola e-mail account on an Apple device then I would advise you contact our helpful Support Team by calling 01376 55 60 60 or via our online system found at https://secure.freeola.com/support/request/ for assistance. I agree with Mattbn3 - this doesn't work - you can do the set up and the account is verified, but have you tried sending from the device using the domain address in the 'From" field? All messages are rejected by the server and sit in the Outbox. Not very happy at the moment as I have emails coming in - to the iphone mailbox - but cannot respond. As I explained to Matt, these guides are regularly checked, and updated when necessary, to ensure they are relevant for the most up-to-date versions of the software, or device, in question. From looking into your account, I can see you have already contacted our Support Team regarding this issue. I would strongly advise following their advice, paying particular attention to the section regarding outgoing server usernames and passwords, as the server log shows that this is where your issue lies. If you require further assistance with this matter, you should reply to your ticket conversation with my Support colleagues. From looking into the server logs, it seems that you may have missed, or mis-entered, the Username and Password details for the outgoing mail server. I would advise that you ensure you have entered all information correctly during the set-up of the account. As the guide above says, Apple devices will list these fields as 'Optional'. This is incorrect, and this information needs to be entered for the account to work properly with authenticated SMTP servers, such as we use for Email Freedom and EmailPro. If you are having further issues setting this account up, please contact Freeola Support on 01376 55 60 60 or via our online system found at https://secure.freeola.com/support/request/. This guide is updated regularly to reflect any changes that may have rolled out with newer versions of the software. I have checked the accuracy of this guide for you just now, and it fits with what I am seeing on the IOS 'Mail' application. From looking at the server logs for your account, it seems that the account you have set up on your PC has the incorrect authentication on the 'Outgoing Server' details. I would advise you double-check this information within Thunderbird. If you are having further issues setting up your account within any device, I would advise you contact our helpful Support Team by calling 01376 55 60 60 or via our online system found at https://secure.freeola.com/support/request/ for assistance. From looking into the server logs for your account, it seems that your sending issue is caused by a lack of outgoing server username and password information. As the guide above intimates, Apple devices list this as optional, which is incorrect in this case. Just worked perfectly for me! Thanks. 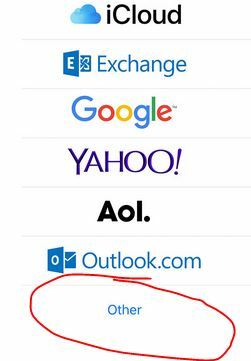 I can only send and receive mail on my iPhone when working on wifi network. Why does it not work the rest of the time? If your iPhone is only sending mail over your WiFi connection it is likely that your SMTP server is set to that of your internet provider. If you are subscribed to our EmailPro service for your Freeola address you will be able to use 'smtp.freeolamail.net' from any type of internet connection in any location. Should you require assistance in setting up your account with these settings or subscribing to this service, please contact the Support Team on 01376 55 60 60 or via our online system found at https://secure.freeola.com/support/request/.